For most pizza aficionados, only a pizza baked in a real brick oven will do. 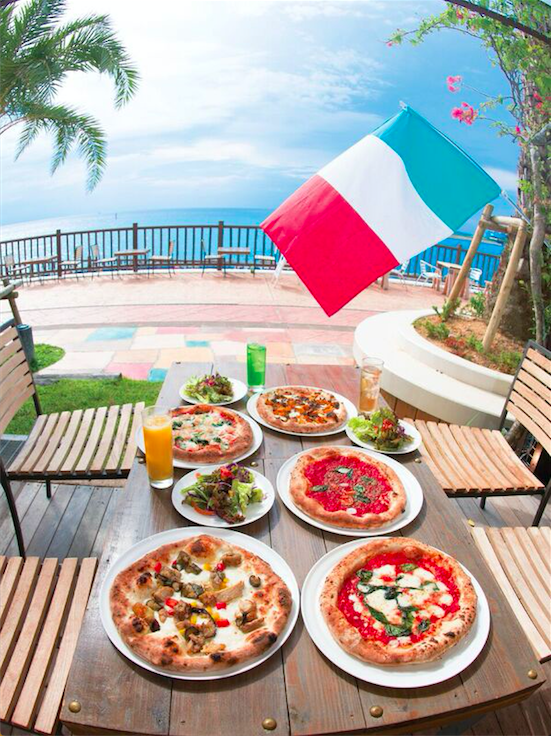 One of the latest restaurants to fill this requirement is Pizzeria Bar Ariccia at the American Village seawall in Mihama. The restaurant’s most important feature is its authenticity. One could almost imagine walking into a real Italian trattoria somewhere along the coast of the Mediterranean when entering Ariccia. 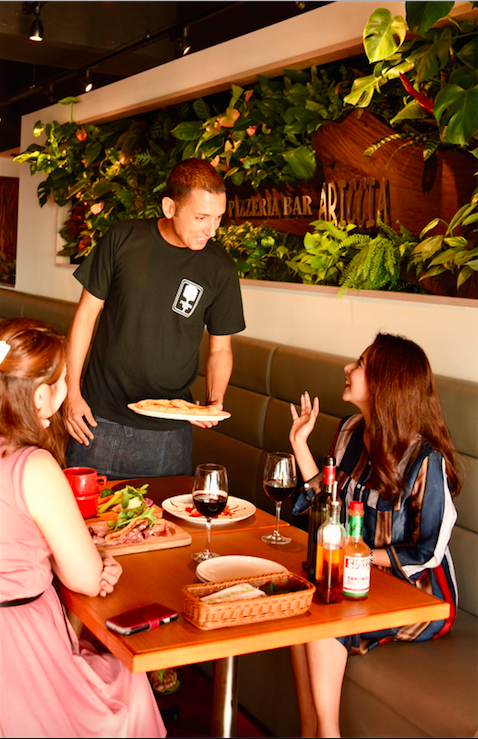 Everything you’d expect is there, including the Italian that some of the staff use when talking among themselves, and the delicious aroma of freshly baked bread, garlic and Italian spices. The atmosphere is relaxed and casual, and the magnificent ocean view opening in front of the restaurant is an extra bonus. The restaurant has seating both inside and out on the deck. All seating, even inside the restaurant, offers the same panoramic view. As the name implies, pizza is the king of the menu. Customers can choose from no less than 27 varieties priced between ¥780 and ¥1,980. 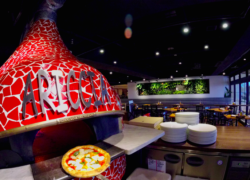 All of the pizzas are made to order in a huge red brick oven imported from Naples. Other items on the menu include seasonal pasta, fish and chicken dishes. The lunch set is reasonably priced at ¥1,080, especially considering the amount of food served, and includes a house salad, pizza and beverage. 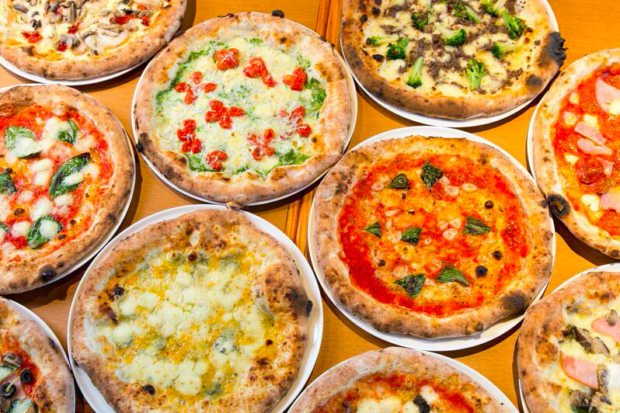 There are five pizza options: marinara, margherita, the monthly special, pizza bianco and pizza rosso. 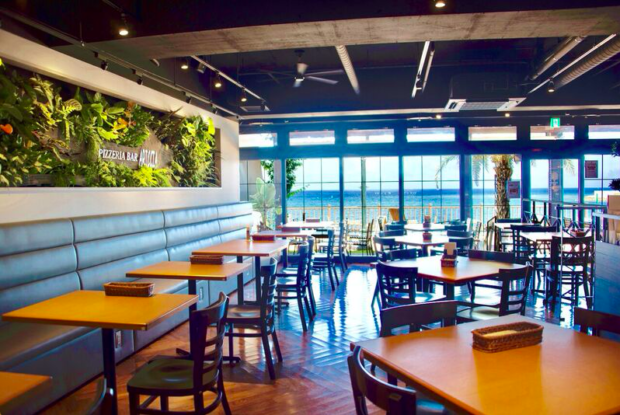 In addition, looking out at the beautiful blue ocean while enjoying your meal provides a pleasant midday break from the hustle and bustle of daily life. On Fridays and Saturdays customers can linger at the open bar until midnight. A selection of pizzas and small snacks is available at the bar to accompany Italian wines, beers and cocktails. All menu items are available for takeout, except the salads.